Obtain real estate analytics to identify your next investment opportunity quickly and with ease! Sign up and gain access to hundreds of thousands of investment properties nationwide, and join our expansive network of real estate investors, agents, and professionals. Mashvisor also allows you to export easy-to-read reports for both the investment property and the neighborhood real estate analytics. 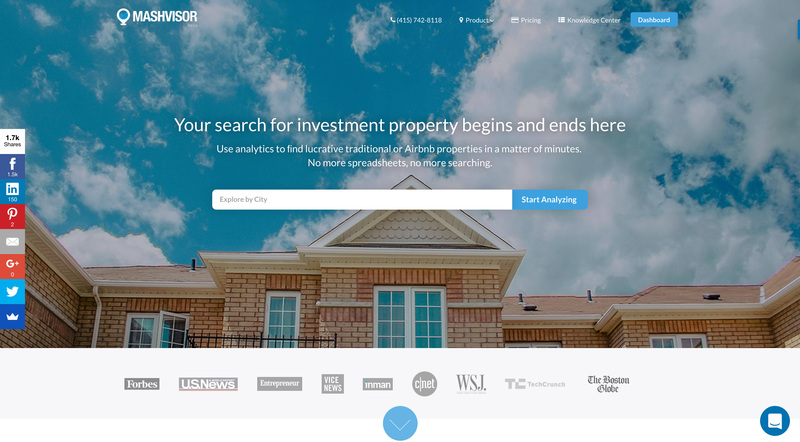 This is a great tool to utilize for sharing the information and the data with a friend, a family member or a real estate agent and to get a second opinion on an investment property or the neighborhood that you want to invest in. The investment property report will include all of the data and real estate analytics that are included in the property analytics page on the platform, all in an easy-to-read PDF format. The neighborhood report is an Excel sheet report containing all the data comps related to the investment properties in the area. 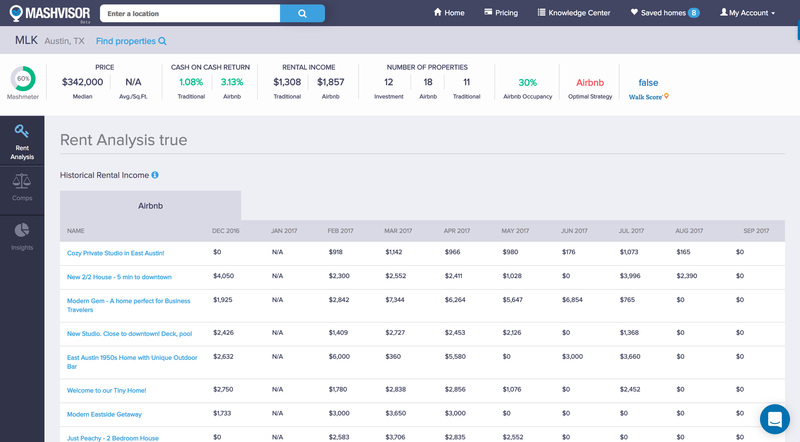 This tool is great for comparing a large number of investment properties with ease to identify the ones with the highest potential for investment. 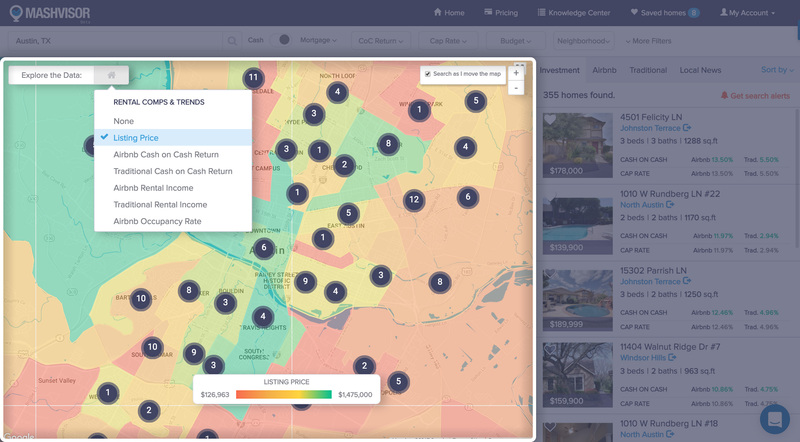 Heat map functionality to search your area of choice for investment properties using visual cues and indicators (heat meter) based on your filter of choice: traditional or Airbnb cap rate, traditional or Airbnb cash on cash return, Airbnb occupancy rate, rental property’s rental income. Search page filters that will allow you to filter out the results based on your search criteria. The filters include: cap rate, cash on cash return, price, age, size, rental income, property status, rental strategy. 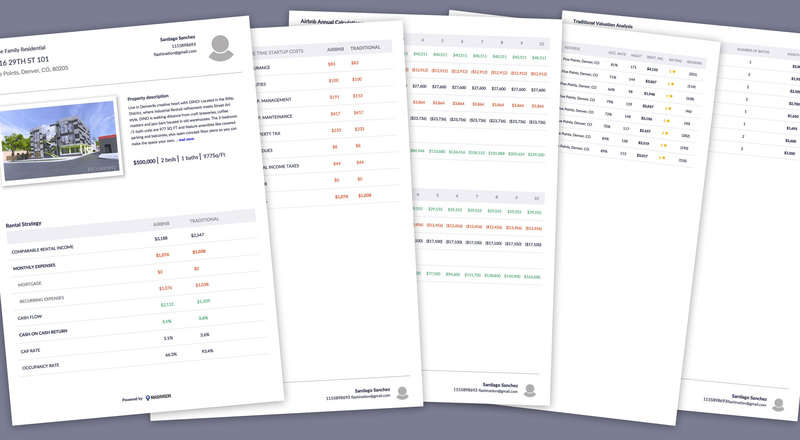 A calculator tool that allows you to calculate and modify the results for each metric (cap rate, cash on cash return, rental income, occupancy rate, cash flow) based on the different expenses (startup costs and recurring costs) or the method of financing (cash vs mortgage, type and duration of the mortgage, and the interest rate of the mortgage). New real estate investors usually don’t know where to begin their research. Mashvisor helps an investor quickly understand and analyze any city or neighborhood’s average investment performance. Investors are able to save time selecting the optimal area for investing and can save months worth of research deciding on this alone. Investors that are looking for their next property are used to analyzing their returns and having built many spreadsheets in the past. Mashvisor automatically calculates the returns of a property for the investor so that they never have to use a spreadsheet again. 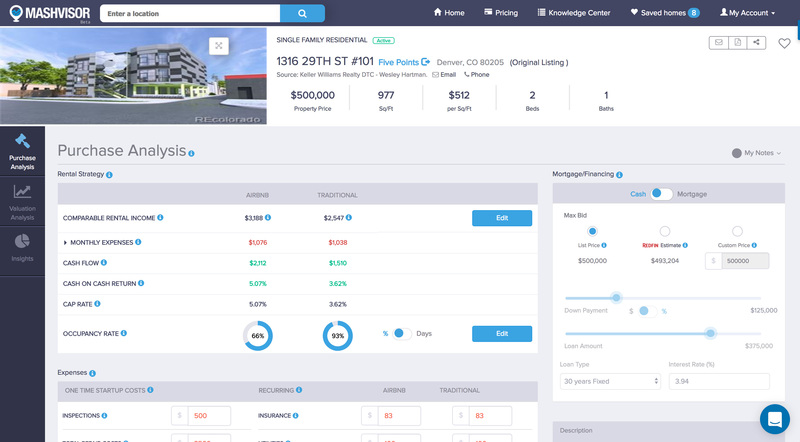 Real estate brokers and agents now have another place to advertise their properties. They can place their listings in front of investors and Mashvisor’s data helps the property better appeal to clients.